Nagake Armor: Kote is a Arm Guards in Nioh. 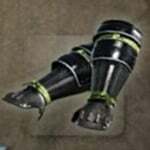 "Simple gauntlets made from thin iron plates. Tough black leather is used to protect the back of the hands. Part of a traditional armor set known as Tosei-gusoku in Japanese, this armor was worn by an elite group of warriors known as the Nagake, who took direct orders from the Date clan. The group consisted of marksmen and foot soldiers, who were used to guard leaders, assist military efforts, deliver messages, and perform various other duties."